Okay, not to weird you out or anything, but this is the mid-week break from the Suffolk Saga and something to give you a giggle; either with me or at me. Just a little bit drool-worthy. Right, the following info is for the train buffs among you - which, I know, means at least Madi's dad, the "B-Cat"!!! I think a few others too. It's the "Pandora", her ID being 88004. 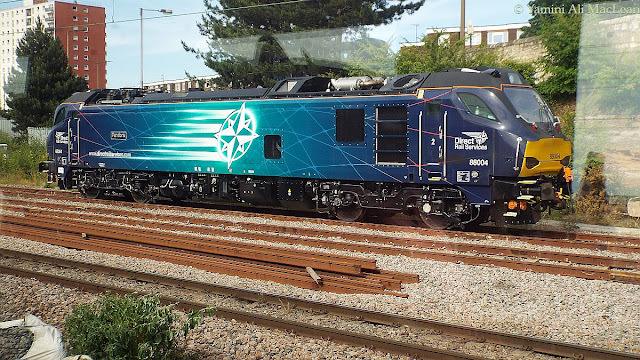 That is to say, she is the fourth off the manufacturer's (Stadler) line in the 88 series of these duel-fuel engines. Hybrid cars? Why not hybrid trains?! Precisely; 25 kV 50 Hz electric and diesel-electric operation. 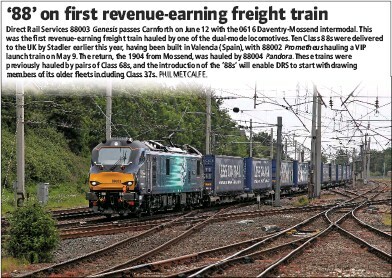 They came into service only a little over a year ago with the 88003 "Genesis". You can see the "Pandora" arriving on UK shores HERE. Oh she's a pretty thing. I just want to go up and hug her... what? Aren't you all having fun yet??? I will have to show this to my husband when he returns from Texas. He is a HUGE train fan and actually crews a very old train that's run for some special train expos. Aunty Yam I am VERY impressed. Win all the problems on the trains just recently I'm amazed you actually found ones to photograph! Wow, she's beautiful! And hybrid!?! Very very cool! Bertie wants to know when he can go for a ride? Gosh! Makes me want to travel across the pond! I LOVE trains! Especially the one that goes through the spiral tunnels in the Rockies! Like Madi's Dad, Ed is a HUGE train fan...can't wait to show him this! I showed this one to hubby in the waiting room yesterday! He loves trains!